Play dough mats are such a fun and easy way to add a little extra to a play dough set up. 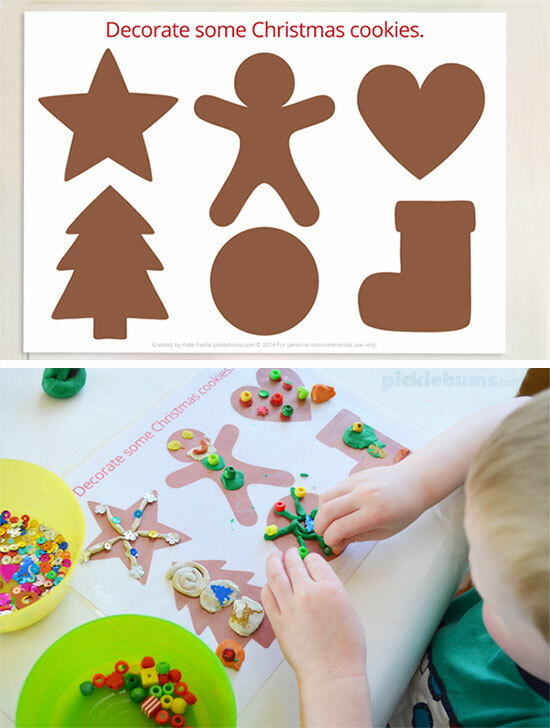 And for some quick and easy Christmas play dough fun, we’re sharing a set of three free printable Christmas play dough mats! I’ve designed all of our play dough mats to be open-ended. They offer a starting point to encourage imagination and creativity. They ask open-ended questions to encourage kids to come up with their own ideas rather than simply following instructions. There are no right or wrong answers, only creativity, exploration and fun. So if you want to dress Santa in a swimsuit that’s awesome! And if your Christmas tree has a dinosaur at the tippy top, that’s cool too! We used modelling clay today, but you can use any kind of play dough or clay. Add some accessories such as sequins, buttons, beads, and tinsel and anything else that takes your fancy. First you need to decorate your Christmas tree. What will you put on the top? 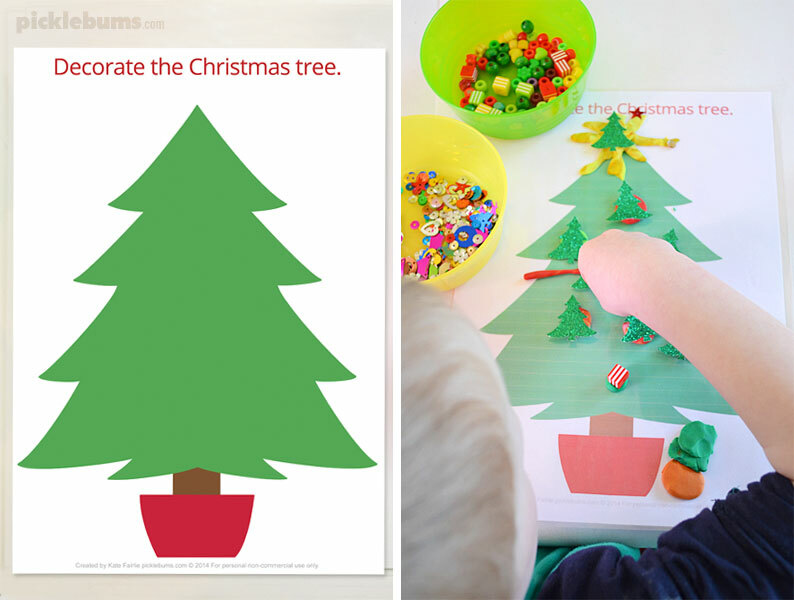 You can download the ‘Decorate the Christmas tree’ play dough mat here. Then you need to bake some Christmas cookies, don’t forget to decorate them! 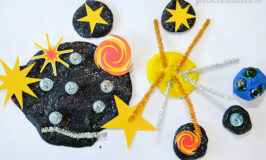 You can download the ‘Decorate some Christmas cookies’ play dough mat here. And then, Santa comes, but he needs some clothes first! Is it hot or cold where you live? Will he need summer or winter clothes? 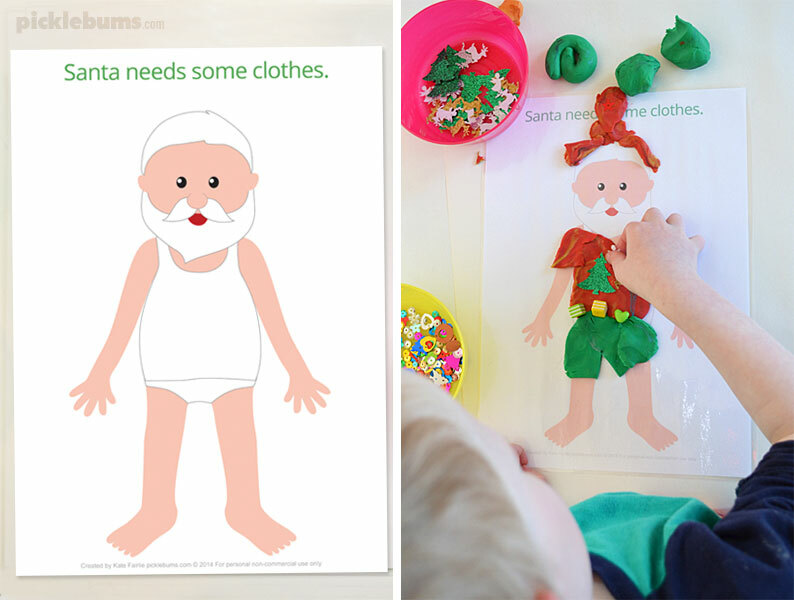 You can download the ‘Santa needs some clothes’ play dough mat here. 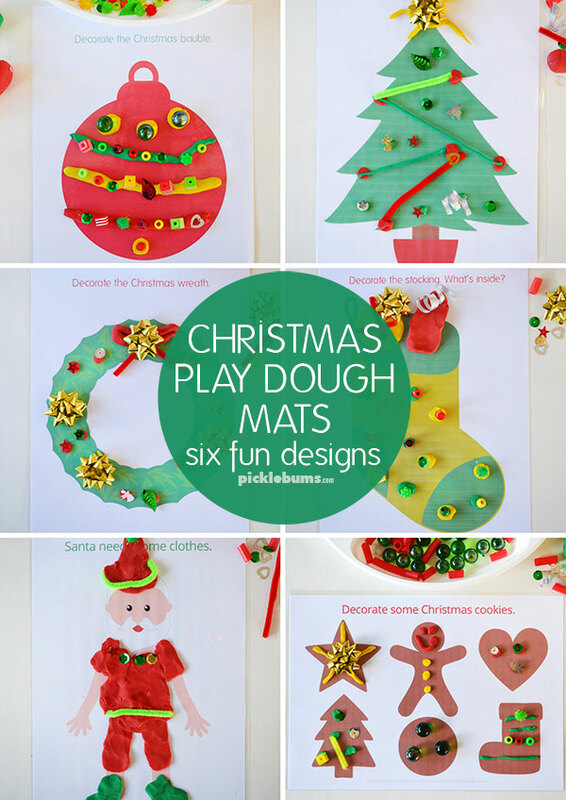 To make your own Christmas play dough mats, just print out the play dough mats and laminate them or cover them in self adhesive paper. 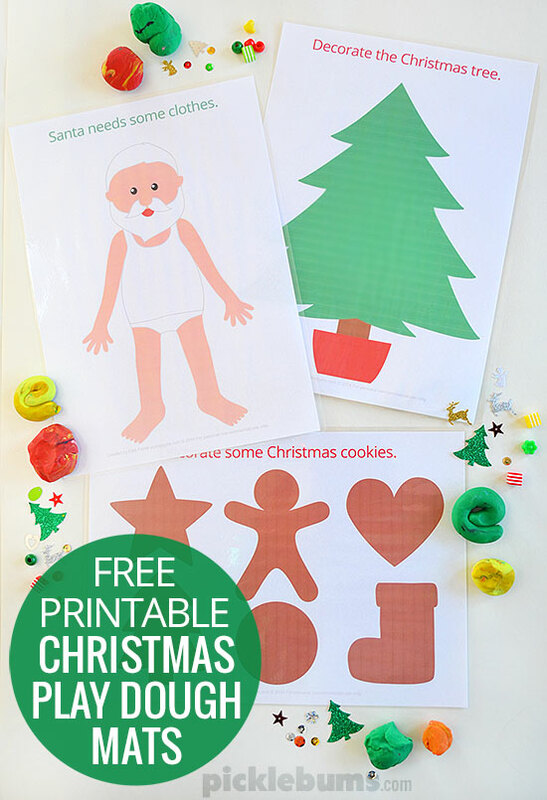 Each of these printable Christmas play dough mats is an A4 sized pdf file. If you are printing on US letter sized paper make sure you choose ‘fit’ or ‘shrink to fit’ from your printer settings. If you love these Christmas play dough mats, you can buy the full set of six Christmas play dough mats in a convenient one file download in our shop. This set includes the three play dough mats seen above, and three brand new, not available anywhere else play dough mats. Use the coupon code christmasplaydoughfun to get a 20% discount until Christmas eve 2017, that makes this set only $3.99! 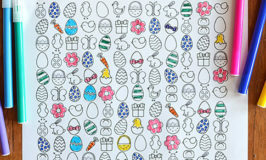 Christie at Childhood 101 has some cool balloon printed wrapping paper. Cathy at Nurture Store has a swooshy candy cane puff pain recipe. Ana at Babble Dabble Do has some cool embossed ornaments made from foil! Meri at Meri Cherry has some gorgeous holiday washi tape wall art. Kristina at Toddler Approved has a fun Christmas sensory board. Gawd you are just to clever…love these!! Might need to have little play myself when I pull the playdough out this week! I love it! This is so much fun!!!! Love your printables, can not wait for kids to get home from the nursery so we can all play. I provided a link for my Czech readers too, hope that’s ok. So, I love these. Perfect to give my 4yo some guidance for his play. My question though…what do you do with all the clay and sequins and decorations at the end? I struggle by the minute with clean up and organization and it all just ends up as clutter because I don’t know what to DO with the STUFF!! Your ideas are so wonderful, just curious about the “behind the scenes” aspect, cuz I know it’s a constant battle in my house! These are so great! I just showed them to my 4yo son and he’s very excited to play with them. Time to get printing! Thanks Kate. Oh Kate, we can always count on you for such great printables and playdough mats! I’m excited to use the modelling clay for a change too :D Thanks for the reminder, & great prints! Happy Holidays! Great idea! Thank you for the printables! Loved the playdough mats. Thank you so much. I shall be using it in my class room extensively! It’s a really nice collection of different themes. Thanks once again!